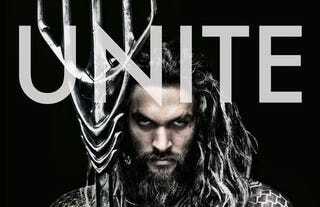 Zack Snyder just tweeted the first image of Jason Momoa as Aquaman. While the Batman v. Superman movie is less B v. S and more of a pre-game for the JLA movie, this has definitely gotten my attention. And now I'm dying to see Aquaman roll up to Gotham Harbor on a shark like the true Khal of the Seas. The tattoos that mimic the fish-scale shirt are a nice spin on the classic design. While I'm not the biggest fan of this universe's uber-serious, washed out pallet, the golden armor is pretty badass, especially when paired with the Atlantean King's Trident. Look at him! No one's going to make fun of this Aquaman. He'll spear you and toss you to the sea lions.